These carburetor jets are used in all year Rochester Quadrajet carburetors, except electronic models with a Mixture Control Solenoid. Used to tailor primary enrichment. Number indicates jet size and dimension of jet hole. A larger diameter jet will richen the entire fuel curve, from part throttle to full throttle. Re-jetting your Q-Jet can pay big dividends at the race track and increased fuel efficiency. Jet number is stamped into each jet. Note: Customize your Jet Bulk pack by selecting eight pairs of Primary Jets that will be most useful to you. At checkout, type in the 8 Primary Jet sizes that you want in the comments area. If you don't specifically request 8 jets you will receive the standard assortment of .065", .067", .069", .071", .073", .075", .077", .079" jets. 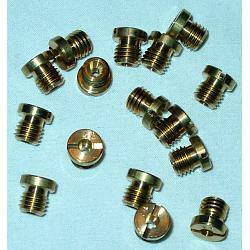 These are correctly profiled jets made specifically made for the Rochester Quadrajet carburetor. Rochester products made several different styles of jets for use in Quadrajets, 1bbl and 2bbl carbs, each with there own unique leading and trailing profile on each side of the jet orifice. Be careful as all the various styles will physically interchange and for example, they could all have a .070" jet orifice but due to the leading and trailing profiles being different, each style will have different flow rates. Quadrajet carburetors are especially sensitive , as the "height" of the jet orifice must be correct otherwise the metering rod will not be positioned correctly inside the jet orifice. 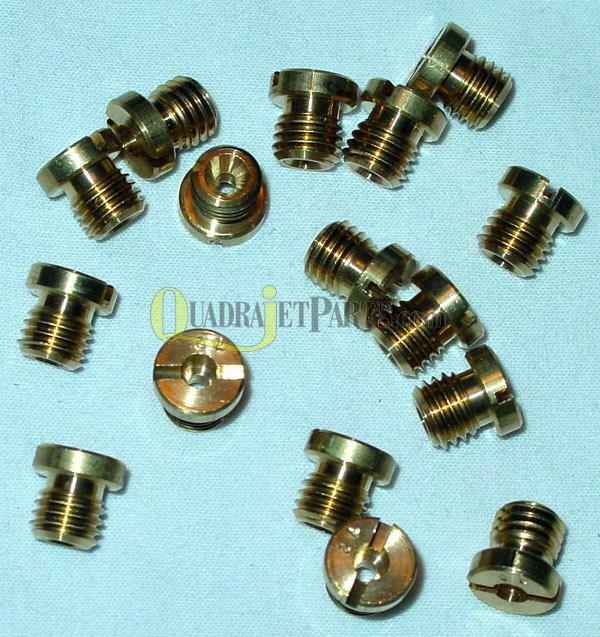 Make sure that you are using correct Quadrajet primary metering jets in your Q-Jet carburetor by using QuadrajetParts.com jets.